Working with measurements isn’t the most exciting topic, but being accurate can make the difference between success and failure when creating packaging. For some of us, all those little lines on a ruler or tape measure can be kind of confusing. To make matters worse we deal with fractions when working in inches. The prediction my grade school teachers made that someday the USA would go to metric never materialized and we are still in inches and fractions. 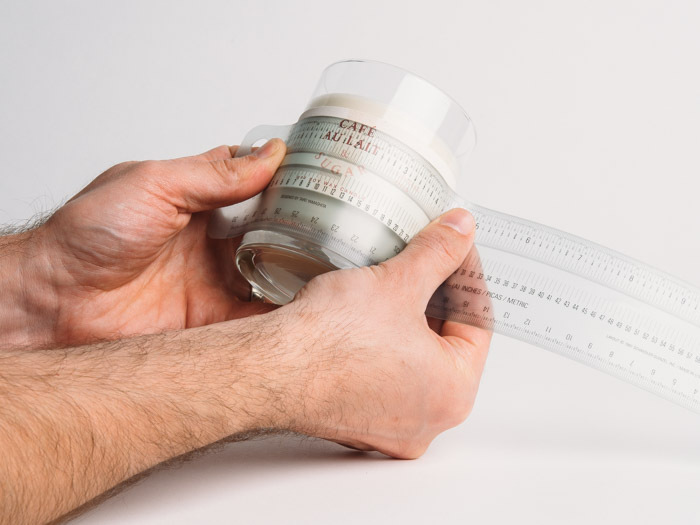 Get the right Ruler – Our favorite ruler is made by Schaedler. They are translucent so you can see through them and flexible, making it very easy to wrap around cylindrical objects like candles when measuring for labels. If your ruler looks like this, give it to your kid or use it for drawing straight lines, but by all means don’t use it for measuring anything except maybe how much snow fell last night. We recommend the blue one that shows inches, metric and if you are really old-school you can use the pica gauge on it. On the inch scale you can actually read the fractions all the way down to 1/32” of an inch. It also shows 64ths but they are too tiny to show the numbers. Yes you will likely need reading glasses or a magnifying glass to read the 32nd of an inch but they are there and you don’t have to figure out what that little line is! They tend to be pricey but worth every penny. You will probably drop about $25 to $35 for one, but once you have it you will wonder how you ever got by without it. You can also buy the set that comes with the pink ruler which shows decimal inches, agate (does anybody measure in agate??) and DTP Points and Picas. If you buy the set that has both rulers you will be looking at around $40 to $50. There are lots of places to buy them on the internet. Amazon of course will have many options. In the interest of full disclosure, we get no financial gain if you buy one – just the confidence that any measurement you relay to us will be accurate!